Where to see the sea, grab exotic dessert and meet an American woman. 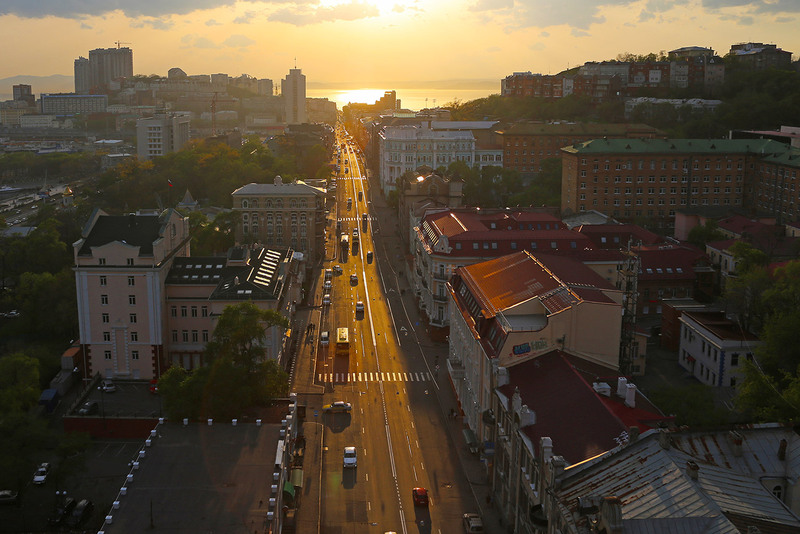 The central street of Vladivostok used to be called Amerikanskaya (American) before 1873. The city’s first and main five kilometer stretch was named in honor of the steam-ship “America” from the Russian Imperial Fleet. The street was renamed Svetlanskaya in honor of the frigate “Svetlana,” on which the Grand Duke Alexei Alexandrovich arrived in Vladivostok. In 1924, the year of Lenin's death, Svetlanskaya was named after the Soviet leader, and in 1992, a year after the fall of the Soviet Union, the street became Svetlanskaya once again. Svetlanskaya begins not far from Sportivnaya Bay with its ferry’s wheel and Ocean movie theater, then flows along music bars, museums, city’s main shopping center and has way more to offer then just beautiful sea views of the Golden horn bay and Vladivostok’s Zolotoy bridge. A native of South Berwick (Maine, U.S.) Eleanor Lord Pray lived in Vladivostok from the late 19th century to 1930. Every day she wrote letters to her family in the U.S., describing both the joys and sorrows of her life in the Russian city perched on the edge of the Pacific Ocean. The letters were found by Birgitta Ingemanson, a professor of Russian literature at Washington State University in the nineties. She embodied Eleanor’s memories into a book, which was translated into Russian and remains dearly beloved by citizens of Vladivostok due to its kindness, passion, and adventurous spirit. A bronze statue of Eleanor Pray with a letter in her hand can be found near her former house in the city. In 1900, Russian officer Vladimir Arsenyev traded high society in St. Petersburg for a rough and tumble life on the Pacific Coast. He moved to Vladivostok and traveled to the wilderness of the Ussuri taiga, hunted wild boars, encountered tigers, and discovered local indigenous peoples. Arsenyev is best known internationally for his Dersu Uzala trilogy of books (1923), which were adapted into an Oscar-winning film by Japanese director Akira Kurosawa. The Arsenyev museum on Svetlanskaya street barely looks like a storage full of very important and boring artifacts: take a tour and spend an hour or two in this space of cognitive activity. Hint: The best shop selling Vladivostok souvenirs is located in the museum, and the yummiest local dessert, bird’s milk, is sold there on the corner of Svetlanskaya and Aleutskaya Street. The famous Vladivostok landmark, built for the 2012 APEC summit, crosses Svetlanskaya Street near house number 63. The monument to the Mariners of the Merchant Fleet was moved due to the construction of the bridge and a fancy coffee shop - Coffetory - is tucked away under the huge structure in a beautiful 19th century building. How it survived during the building of the bridge is anyone’s guess. A marvelous example of Vladivostok’s German art nouveau architecture, the department store GUM was built in 1884 by German businessmen Gustav Kunst and Gustav Albers. Today you can buy a warm parka to fend off the notorious Vladivostok weather or take a tour of the store’s chamber museum. Locals cherish at least two urban legends about this place. When the museum was created, underground tunnels connecting GUM with several buildings in the city center were apparently discovered. Two massive safes were also allegedly built into the walls of the building, which remain unopened! GUM’s old courtyard is a favourite local hang out - a great place to chat and drink a coffee. History buffs will enjoy the best part of the museum: The gun yard. Legendary weapons which protected Port Arthur from Japanese attacks from 1904 to 1905 are on display, so too the the guns used during the dramatic Tsushima naval battle of 1905. This place is definitely worth a visit. In 1971, artist Vladimir Vysotsky visited Vladivostok and played six concerts in the city. You can listen to his eternal lyrics more than 30 years later in Teatralny Square, which is just a stone’s throw from Svetlanskaya Street: The local monument to Vysotsky has built in speakers, which play his songs day and night. Every year the city's biggest Christmas tree is installed in front of the building, and every year it becomes the subject of local memes. The oceanic “breeze” in Vladivostok can be so strong during winter that the Christmas tree takes a tumble - forcing the city authorities to put it back up - sometimes more than once! The locals love posting amusing Photoshopped images when this happens. When Svetlanskaya Street meets Vladivostok’s main square, you can see its dominant landmark, the monument to the Fighters of Soviet Power in the Far East in 1917-1922. Made by Moscow sculptor Alexei Teneta, the monument was unveiled in 1961.